Muscle atrophy is a frequent complication of CKD, and exercise can attenuate the process. This study investigated the role of microRNA-23a (miR-23a) and miR-27a in the regulation of muscle mass in mice with CKD. These miRs are located in a gene cluster that is regulated by the transcription factor NFAT. CKD mice expressed less miR-23a in muscle than controls, and resistance exercise (muscle overload) increased the levels of miR-23a and miR-27a in CKD mice. Injection of an adeno-associated virus encoding the miR-23a/27a/24–2 precursor RNA into the tibialis anterior muscles of normal and CKD mice led to increases in mature miR-23a and miR-27a but not miR-24–2 in the muscles of both cohorts. 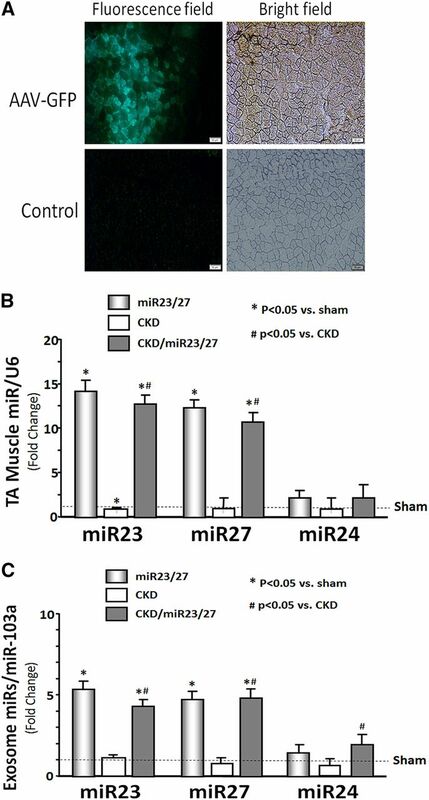 Overexpression of miR-23a/miR-27a in CKD mice attenuated muscle loss, improved grip strength, increased the phosphorylation of Akt and FoxO1, and decreased the activation of phosphatase and tensin homolog (PTEN) and FoxO1 and the expression of TRIM63/MuRF1 and FBXO32/atrogin-1 proteins. Provision of miR-23a/miR-27a also reduced myostatin expression and downstream SMAD-2/3 signaling, decreased activation of caspase-3 and -7, and increased the expression of markers of muscle regeneration. Lastly, in silico miR target analysis and luciferase reporter assays in primary satellite cells identified PTEN and caspase-7 as targets of miR-23a and FoxO1 as a target of miR-27a in muscle. These findings provide new insights about the roles of the miR-23a/27a-24–2 cluster in CKD-induced muscle atrophy in mice and suggest a mechanism by which exercise helps to maintain muscle mass. MicroRNAs (miRs) are short, noncoding RNAs that downregulate proteins by binding to complementary sequences in the 3′-untranslated regions (3′-UTRs) of target mRNAs. This leads to the degradation of the target mRNAs or repression of their translation.22,23 Accumulating evidence suggests that changes in the intracellular level of a number of miRs contribute to muscle atrophy.23–28 In particular, a decrease in miR-23a results in increased translation of TRIM63/MuRF1 and FBXO32/atrogin-1, whereas overexpression of miR-23a protects muscles from glucocorticoid-induced skeletal muscle atrophy.27,29 We have shown that miR-23a is reduced in skeletal muscle of CKD mice, diabetic rats, and dexamethasone-treated C2C12 myotubes.23,26 The decrease was due to reduced transcription of the miR-23a/27a/24–2 genomic cluster and an increase in miR-23a release in exosomes. Like miR-23a, miR-27a is linked to the muscle atrophy process. It can stimulate muscle cell proliferation by inhibiting myostatin expression.30 These links between miR-23a/miR-27a and atrophy proteins suggested that miRs play an important role in the regulation of muscle mass during CKD. We previously found that exercise attenuates muscle wasting and improves insulin/Akt signaling in CKD mice.3 This is noteworthy because expression of miR-23a is induced by NFAT, a calcium/calcineurin-regulated transcription factor that is activated in muscle by exercise. Furthermore, miR-23a and calcineurin/NFAT activity were reduced in muscles of CKD and diabetic rats as well as dexamethasone-treated myotubes.23,26,31 Given these findings, we hypothesized that overexpression of the miR-23a/27a/24/2 cluster in skeletal muscle of CKD mice would improve insulin signaling and attenuate muscle loss. Muscle overload increases miR-23a/27a in muscle of CKD mice. Total RNA was isolated from TA muscles of sham-operated control, CKD, or CKD/overload (CKD/OL) mice. The expressions of miR-23a-3p, miR-27a-3p, and miR-24–2-5p were measured by quantitative PCR. The bar graph shows the fold change of each miR in CKD and CKD/OL groups compared with levels in control mice (represented by a line at onefold). Results were normalized to the U6 snRNA (small nuclear RNA) (bars: mean±SEM; n=12 per group). *P<0.05 versus control; #P<0.05 versus CKD. Because muscle overloading improves muscle protein metabolism, preserves muscle mass, and also, increases miR-23 and miR-27 in muscle of CKD mice, we tested whether overexpression of these miRs in CKD mice produce responses similar to those seen with exercise. To accomplish this, we injected the hind limb tibialis anterior (TA) muscle of control and CKD mice immediately after the second surgery with a recombinant adeno-associated virus (AAV) that expresses GFP (AAV-GFP) or the miR-23a/27a/24–2 precursor (AAV-miR-23a/27a/24–2), respectively; muscles were harvested 4 weeks later. Expression of GFP was clearly detectable in the muscle of mice transduced with AAV-GFP (Figure 2A). Similarly, in muscle transduced with AAV-miR-23a/27a/24–2, the amounts of miR-23a and miR-27a in control mice were increased 14.2- and 12.1-fold, respectively; the same miRs were increased 13.1-fold (miR-23a) and 11.3-fold (miR-27a) in CKD muscle (Figure 2B). miR-24–2 was not increased in the muscle of any mice overexpressing the miR cluster. Transduction of miR-23a/27a/24–2 increases miR-23a and miR-27a in muscle. (A) Shown in the upper panel are representative frozen cross-sections from TA muscles transduced with AAV-GFP in CKD mice; the lower panel shows TA muscle cross-sections from uninjected CKD mice. The left panel shows fluorescence microscopy images to detect GFP expression; the right panel shows unstained bright-field microscopy images of the same muscle sections. (B) Total RNA was isolated from TA muscles of control or CKD mice injected with AAV-GFP or AAV-miR-23a/27a/24–2 mice. The amounts of mature miRs were measured by quantitative PCR. The bar graph shows miRs from the muscles of each group of mice. Results are normalized to U6 snRNA (small nuclear RNA) (bars: mean±SEM; n=12 per group). *P<0.05 versus CKD; #P<0.05 versus sham. (C) Exosomes were isolated from serum of sham, sham plus miR-23a/27a, CKD, and CKD plus miR-23a/27a mice. Total RNA was extracted from the exosome preparation, and miR-23a/27a/24–2 was measured by quantitative PCR. The bar graph shows the amount of mature miRs from the exosomes of each indicated cohort of mice. Results are normalized to miR-103a (bars: mean±SEM; n=12 per group). *P<0.05 versus CKD; #P<0.05 versus sham. We recently showed that cultured myotubes control the levels of specific miRs in part through their release in exosomes.26 Therefore, we next evaluated whether CKD or overexpression of the miR-23a/27a/24–2 precursor miR would alter the levels of the mature miRs in circulating serum exosomes. Transduction of the miR cluster increased the levels of all three miRs in serum exosomes of CKD mice, whereas miR-23a and miR27a were increased in the exosomes from control mice (Figure 2C). To examine the effects of overexpressing the miR-23a/27a/24–2 cluster on muscle mass, the dry weights of soleus, extensor digitorum longus (EDL), and TA muscle were measured. Dry weights of soleus, EDL, and TA muscle were significantly decreased in CKD mice versus controls (Table 1). Transduction of AAV-miR-23a/27a/24–2 into the TA of control mice had no effect on muscle mass; however, the treatment did improve the mass of the TA, soleus, and EDL muscles in CKD mice (Table 1), and these responses translated into an increase in muscle grip strength. CKD mice treated with AAV-miR-23a/27a/24–2 had an increase in grip strength compared with CKD mice (CKD/AAV-GFP: 4.1±0.3 kg-force/100 [KGF−2]; CKD/miR-23a/27a/24–2: 5.8±0.4 KGF−2; P<0.05 versus CKD/AAV-GFP). However, the grip strength of CKD mice treated with AAV-miR-23a/27a/24–2 (CKD/miR-23a/27a/24–2) remained significantly less (P<0.05) than that of sham mice injected with either AAV-GFP or AAV-miR-23a/27a/24–2 (sham/AAV-GFP: 6.5±0.4 KGF−2; sham/miR-23a/27a/24–2: 6.8±0.8 KGF−2); the shams were not different. We next investigated possible mechanisms by which overexpression of miR-23a/27a might attenuate muscle loss by examining Akt/FoxO signaling. CKD decreased the amount of phosphorylated (i.e., active) Akt. The amounts of phosphatase and tensin homolog (PTEN) and dephosphorylated (i.e., active) FoxO1 were increased (Figure 3A).9 FBXO32/atrogin-1 and TRIM63/MuRF1 were also increased (Figure 3A). In the muscle of CKD mice injected with AAV-miR-23a/27a/24–2, phosphorylated Akt and FoxO (i.e., inactive) were increased versus CKD mice, whereas PTEN, FBXO32/atrogin-1, and TRIM63/MuRF1 were reduced (Figure 3A). miR-23a/27a overexpression improves muscle protein metabolism, attenuates caspase activity, and increases markers of muscle regeneration. (A, B, and D) Shown are results of representative Western blot analyses of (A) Akt, p-Akt, FoxO1, pFoxO1, PTEN, TRIM63/MuRF1, and FBXO32/atrogin-1; (B) actin cleavage; and (D) markers of muscle regeneration in TA muscle lysates from sham controls, sham plus miR-23a/27a, CKD, and CKD plus miR-23a/27a mice. The bar graphs show the fold change of each protein band or ratio of phosphoprotein to total protein relative to the levels in sham mice (represented by a line at onefold). All band densities were normalized to the density of GAPDH (Glyceraldehyde 3-phosphate dehydrogenase) (bars: mean±SEM; n=12 per group). YY1, Yin Yang 1. *P<0.05 versus control; #P<0.05 versus CKD. (C) The changes of caspase-3 and -7 activities were measured by a fluorogenic substrate using lysates of TA muscle from four groups. Bars: mean±SEM; n=12 per group. *P<0.05 versus control; #P<0.05 versus CKD. Caspase-3–mediated proteolysis is another process that contributes to muscle atrophy in CKD and other wasting states.18 Actin is a caspase-3 substrate, and the amount of 14-kD peptide released by cleavage serves as an atrophy biomarker.19,20,33 A variety of signals controls the caspase cascades, including Akt.18,34,35 Given the link between caspase-3 activation and muscle atrophy, we investigated whether miR-23a/27a influences this process. CKD increased caspase-3 activity and the amount of actin fragment (Figure 3, B and C), and both responses were reduced by overexpression of miR-23a/27a (Figure 3, B and C). An in silico analysis of miR-23a targets predicted that it binds to the 3′-UTR of caspase-7, another executioner caspase. Its activity was 1.7-fold higher in the muscle of CKD mice and significantly decreased in control and CKD mice injected with AAV-miR-23a/27a/24–2 (Figure 4C). Exogenous miR-23a/27a represses myostatin mRNA and attenuates CKD-induced inflammatory cytokine mRNAs. (A) Total RNA was isolated from TA muscles of sham, sham plus AAV-miR-23a/27a/24–2, CKD, and CKD plus AAV-miR-23a/27a/24–2 mice. Quantitative PCR was used to measure myostatin mRNA. The bar graph shows the relative amount of myostatin mRNA in each cohort expressed as a fold change from the sham mice (line indicates controls set as onefold). Results are normalized to 18S mRNA (bars: mean±SEM; n=12 per group). *P<0.05 versus control; #P<0.05 versus CKD. (B) Myostatin plus total and phosphorylated SMAD-2/3 were measured by Western blot analysis in lysates of TA muscles from the indicated cohorts of mice. The bar graph shows the fold change of each protein band compared with levels in sham mice (represented by a line at onefold). For SMAD-2/3, the data are expressed as the ratio of phosphoprotein to total protein. All band densities were normalized to the density of GAPDH (Glyceraldehyde 3-phosphate dehydrogenase) (bars: mean±SEM; n=12 per group). *P<0.05 versus control; #P<0.05 versus CKD. (C) Levels of IL-6, IFN-γ, TNF-α, and IL-4 mRNA were measured by quantitative PCR. The bar graph shows the mean mRNA level in each cohort of mice expressed as a fold change from the sham controls (line indicates controls set as onefold). Results are normalized to 18S rRNA (bars: mean±SEM; n=12 per group). *P<0.05 versus control; #P<0.05 versus CKD. Because CKD impairs muscle regeneration, we examined whether overexpression of miR-23a/27a would affect key proteins in this process.3,13 As reported, CKD reduced the levels of MyoD, myogenin, and embryonic myosin heavy chain (eMyHC) in muscle, whereas the myogenic repressor Yin Yang 1 was increased (Figure 3D). These responses were reversed in the muscle of CKD mice transduced with AAV-miR-23a/27a/24–2 (Figure 3D). Because myostatin negatively regulates muscle size and is increased in wasting conditions, like CKD and cancer,15 we next examined myostatin expression and its effector proteins, the Mothers against decapentaplegic homolog-2 (SMAD-2) and SMAD-3 transcription factors. Transduction of sham control TA muscles with AAV-miR-23a/27a/24–2 did not change myostatin mRNA but reduced myostatin protein (Figure 4, A and B). Myostatin mRNA and protein were increased 3.2- and 1.8-fold, respectively, in muscle of CKD mice versus controls, and AAV-miR-23a/27a/24–2 attenuated the increase in both mRNA and protein. Consistent with the increase in myostatin protein, the ratio of total to phosphorylated SMAD-3 protein was increased by CKD but not for SMAD-2 (Figure 4B). SMAD-3 phosphorylation was significantly decreased in control and CKD muscles transduced with AAV-miR-23a/27a/24–2. 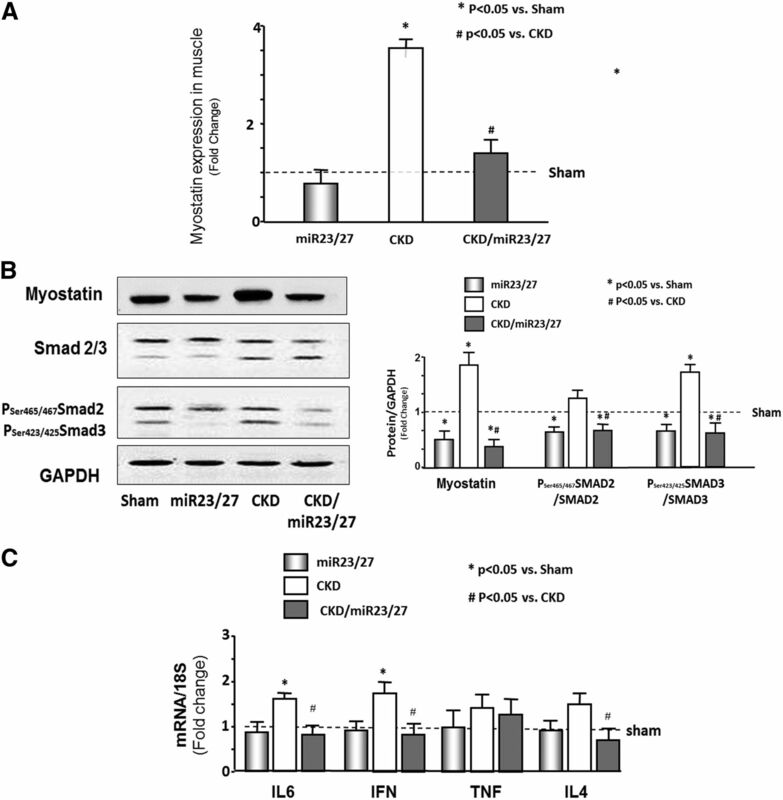 Overexpression of miR-23a/27a also reduced phosphorylated SMAD-2. In addition to increased myostatin production, CKD augments the levels of inflammatory cytokines that impair insulin/IGF-1 signaling in muscle.11 In this study, the muscle levels of mRNAs encoding IL-6 and IFN-γ were significantly increased with CKD, whereas TNF-α and IL-4 were slightly but not significantly elevated (Figure 4C). Injection of AAV-miR-23a/27a/24–2 did not change the baseline levels of these mRNAs in the TA muscle of control mice, but it significantly decreased the levels of IL-6, IFN-γ, and IL-4 in CKD mice (Figure 4C). The analysis predicted two miR-23a target sites in the 3′-UTR of the PTEN mRNA at bases 1596–1603 and 2270–2277. Luciferase reporter plasmids were constructed to test each target site separately—pMIR-phosphatase and tensin homolog/1576–1626 (PTEN/a) and pMIR-phosphatase and tensin homolog/2250–2301 (PTEN/b). Addition of an miR-23a mimic to cells transfected with the PTEN/a reporter resulted in a 74% decrease (P<0.05) in luciferase activity relative to the activity in cells treated with a scrambled control mimic; the miR-23a mimic did not affect the PTEN/b reporter activity (Figure 5A). Similarly, expression of a hairpin inhibitor of miR-23a increased in luciferase activity in cells transfected with pMIR-PTEN/a but did not increase in cells transfected with pMIR-PTEN/b. miR-23a/27a bind to atrophy-related targets. (A) Satellite cells were cotransfected with pLuc‐ctrl (pMIR-REPORT Luciferase), pMIR-PTEN/1576–1626 (PTEN/a), or pMIR-PTEN/2250–2301 (PTEN/b) and either an miR-23a mimic (miR-23) or miR-23a inhibitor (hairpin inhibitor of miR-23a [sh-miR-23]). 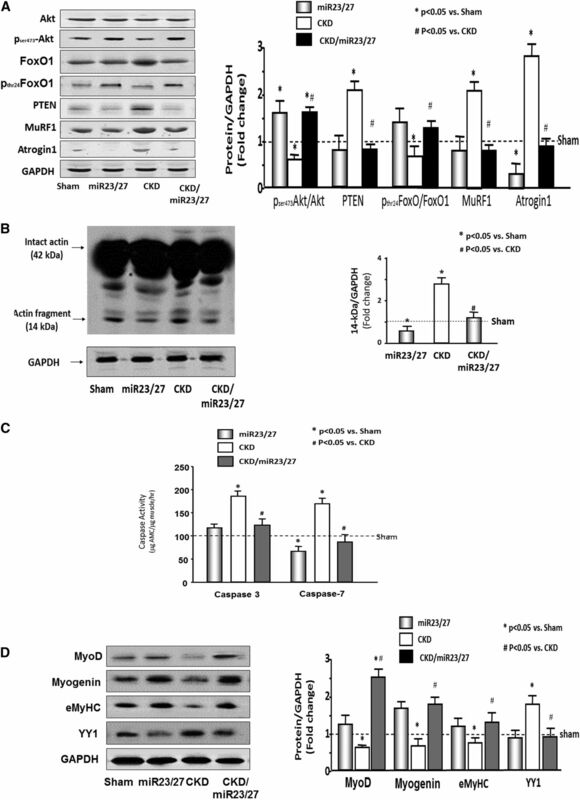 (B) Satellite cells were cotransfected with pLuc‐ctrl (pMIR-REPORT Luciferase) or pMIR‐caspase7/1115–1122 (Casp7) and either an miR-23a mimic (mi-R23) or miR-23a inhibitor (sh-miR-23). (C) Satellite cells were cotransfected with pLuc‐ctrl (pMIR-REPORT Luciferase), pMIR-FoxO1/412–418 (Fox/a), or pMIR-FoxO1/2412–2418 (Fox/b) and either an miR-27a mimic (mi-R27) or miR-27a inhibitor (sh-miR-27). For all experiments, the luciferase activity in cells transfected with pLuc‐ctrl (pMIR-REPORT Luciferase) and incubated with a scrambled miR was designated as the 100% activity level (designated by horizontal lines in the graphs). The results are expressed as the mean normalized luciferase activity expressed as percentages of the control treatment for each experiment. Three wells were used for each condition/experiment, and each experiment was repeated three times; the results of all experiments were combined. The data represent mean±SEM (n=9). FFL/RL, Firefly luciferase/Renilla luciferase. *P<0.05 versus mimic control. A single miR-23a binding site was predicted in the caspase-7 3′-UTR (site: 1115–1122). In satellite cells transfected with pMIR-caspase-7/1095–1155, the miR-23a mimic decreased luciferase activity 42% (P<0.05), and mutation of the binding site prevented the response (Figure 5B). The hairpin inhibitor of miR-23a increased luciferase activity 1.6-fold (P<0.05) in cells transfected with pMIR-caspase-7/1095–1155 (Figure 5B). Two binding sites for miR-27a were predicted at bases 412–418 and 2412–2418 in the 3′-UTR of FoxO1. To test the functionality of these sites, satellite cells were transfected with pMIR-FoxO/395–460 and pMIR-FoxO/2384–2444; treating cells with an miR-27a mimic produced 74% and 55% decreases in the luciferase activities, respectively (Figure 5C). In earlier studies, miR-23a was shown to target TRIM63/MuRF1 and FBXO32/atrogin-1 in HeLa cells, and miR-27a was reported to target myostatin in C2C12 cells.27,28,30 This led us to test whether these miRs have similar actions in satellite cells using 3′-UTR reporter genes (Supplemental Figures 1–3). Consistent with the findings with CKD mice, transfected miR-23a targeted the 3′-UTR of both TRIM63/MuRF1 and FBXO32/atrogin-1. Similarly, transfected miR-27a targeted the 3′-UTR of myostatin (Supplemental Figure 4). CKD is typically associated with protein-energy wasting exemplified by the loss of lean body mass. The signals that induce muscle loss in patients with CKD include metabolic acidosis, glucocorticoids, inflammatory cytokines, myostatin, and insulin resistance. To date, few therapies have proven to be effective at maintaining muscle mass in patients with CKD; exercise is the most promising therapy identified to date.3 Despite the involvement of multiple proteolytic systems and overlapping signaling networks, most therapies for muscle loss typically target individual signaling or effector proteins. In contrast, miRs are an appealing alternative for treating the muscle atrophy of CKD and other wasting disorders, because they simultaneously regulate the expression of multiple proteins. Furthermore, a number of miRs are modulated by CKD and other wasting conditions.22,23,25,26 In this study, we provide evidence supporting the use of miRs as a therapy for muscle wasting due to CKD as well as insights into a potential mechanism by which exercise produces its muscle-sparing effects. Another major finding of this study is that overexpression of the miR-23a/27a/24–2 cluster in muscle reversed many of the catabolic responses induced by CKD. On the basis of previous reports,23,24 we anticipated that overexpression of miR-23a would lead to a decrease in the TRIM63/MuRF1 and FBXO32/atrogin-1 E3 ubiquitin ligases. Given that miR-27a has been shown to target myostatin, we also anticipated that raising its level would reduce the myokine in CKD muscle.28 However, we were surprised to find that other aspects of muscle atrophy signaling were also affected by overexpression of miR-23a/27a/24–2. Raising the level of miR-23a/miR-27a restored Akt signaling, decreasing PTEN and FoxO1 activation as well as the levels of inflammatory cytokines and markers of muscle regeneration. It also attenuated the activity of caspase-3 and -7 and reduced the cleavage of actin. These unexpected findings led to the identification of several new targets of miR-23a and miR-27a that are relevant to the atrophy process—PTEN, caspase-7, and FoxO1. The mechanisms responsible for the reduction in inflammatory cytokines and caspase-3 activity remain unclear and could be direct or indirect consequences of raising the levels of miR-23a and/or miR-27a. A final notable finding in our study is that overexpression of the miR-23a/27a/24–2 cluster led to a significant improvement in overall muscle function as measured by an increase in grip strength, although there was no overall effect on body size. This finding is intriguing, because it suggests that muscles other than the TA were affected by the treatment. We previously showed that muscle cells selectively package miRs into exosomes that are released into the circulation. Exosomes released from myofibers can be taken up locally by satellite cells, other muscle fibers, and cells in other organs.43 In our study, serum exosomes isolated from control and CKD mice with TA muscles that were injected with AAV-miR-23a/27a/24–2 contained four- to fivefold higher amounts of miR-23a and miR-27a than mice that received vehicle control AAV-GFP. These findings suggest that exosomes containing these mature miRs could be taken up by adjacent muscles and influence the atrophy process. This possibility is supported by a preliminary finding that mature miR-23a was significantly higher in the gastrocnemius muscle and some other nonmuscle organs (e.g., heart and liver) of control mice injected in the TA with AAV-miR-23a/27a/24–2 (S.R.P. and X.H.W., unpublished data). These findings do not exclude a second possibility that some AAV-miR-23a/27a/24–2 was released from the muscle after transduction, infected other tissues, and was processed into mature miR-23a. However, this latter possibility seems unlikely because we only transduced 1010 pfu AAV into the TA, and only a small portion of this should be released or escape from the TA. In an attempt to determine if overexpression of miR-23a/27a caused any unintended changes in muscle structure/function, muscle sections of control and CKD mice injected with AAV-miR-23a/27a/24–2 were stained with Masson trichrome staining to examine fibrosis. Neither CKD nor overexpression of miR-23a/27a changed the baseline level of collagen expression (data not shown). In summary, our findings highlight how miRs play an important role in the regulation of muscle atrophy in CKD. miR-23a and miR-27a are derived from an miR cluster on chromosome 9 that is under the transcriptional control of calcineurin/NFAT signaling. This mechanism may explain why exercise increases the levels of these miRs in the muscle of CKD mice. Given the substantial number of key atrophy-related proteins targeted by these two miRs, their increase during exercise likely contributes to the amelioration of several facets of the atrophy process, including improvements in Akt and SMAD-2/3 signaling, markers of caspase-3–mediated actin degradation, muscle regeneration, and reduced expression of FoxO1 and myostatin. Indeed, these responses translated into greater muscle mass and strength during CKD. When considered altogether, our results emphasize the potential of miRs as a useful alternative to exercise in the treatment of muscle wasting in CKD and other conditions associated with muscle loss and protein-energy wasting. The miR-23/27–24–2 was cloned into pTR-UF5 vector, which contains a GFP coding sequence (pTR-miR-23/27/24–2) by Emory Integrated Genomics Core. The control AAV (AAV-GFP) encoded GFP only.33 AAV was produced and titered by the Viral Vector Core of the Emory using a three-plasmids system. The stock virus titer was 3.4×1014 viral genome (vg) per 1 ml for AAV-miR-23/27/24–2 and 6.5×1014 vg per 1 ml for AAV-GFP; 20 μl viral preparation (1010 vg) was injected into TA muscle over 5 minutes using a Hamilton syringe (30-gauge needle). Both legs of each mouse were injected with the same type and same amount of AAV. Four cohorts of mice were studied—sham mice injected with AAV-GFP, sham mice injected with AAV-miR-23a/27a/24–2, CKD mice injected with AAV-GFP, and CKD mice injected with AAV-miR-23a/27a/24–2. A modified pair-feeding protocol was used, in which the amount of food consumed by each CKD plus AAV-miR-23a/27a/24–2 mouse was provided to a matched mouse in the other three cohorts. Equal amounts (10–30 μg) of protein samples from TA muscle lysates were separated electrophoretically and transferred to a PDVF membrane for Western blot analyses.5,44 After membrane blocking and incubation with primary and secondary antibodies, recognized protein bands were quantified using the Li-cor Odyssey infrared scanning system (Li-COR Biosciences, Lincoln, Nebraska). Actin cleavage was detected by an antibody against the C-terminal actin fragment (recognizes the C-terminal 11 amino acids of actin; 1:500 dilution; Sigma-Aldrich).19 Primary antibodies (1:1000 dilution except where indicated) that we used included Akt/p-Akt (Ser473), FoxO1/p-FoxO1 (Thr32), FoxO3/p-FoxO3 (Thr32), pSmad-2/3 (D27F2), and Smad-2/3 (D7G7) from Cell Signaling; MyoD, Myogenin, and eMyHC are from DSHB Product (University of Iowa, Lows, IA). PTEN (FL-403) is from Santa Cruz (Santa Cruz, CA); GAPDH is from Millipore (Burlington, MA). Myostatin is from Abcam (Cambridge, MA); Yin Yang 1 is from Santa Cruz (Santa Cruz, CA). Total RNA was extracted using Tri-Reagent (Molecular Research Inc., Cincinnati, OH). The detail of RT-PCR and quantitative PCR procedures is in Supplemental Material.4,6 Primers for mRNA are listed in Table 2. For miR, the primers were purchased from Exiqon. Mouse U6 snRNA was used to normalize expression of individual miRs, miR-103a was used for exosomal miRs, and 18S rRNA was used for mRNAs. Differences between treatments were calculated using the ΔΔCt method. Satellite cells were isolated from hind limb muscles of 4-month-old mice as described.36,45 Dissociation of mouse skeletal muscle tissue into single-cell suspensions was performed using a Skeletal Muscle Dissociation Kit (130–098–305; MACS; Miltenyi Biotec, Inc., Auburn, CA), and a Satellite Cell Isolation Kit (130–104–267; MACS) was used to isolate muscle progenitor cells. Satellite cells were identified using anti-eMyHC (Supplemental Figure 1). Anti–α-smooth muscle actin (Sigma-Aldrich) was used to identify fibroblast contamination, and no positive cells were identified (data not shown). Effectene transfection reagent was used for transfection (Qiagen, Valencia, CA) of muscle primary satellite cells.36,45 Firefly and Renilla luciferase activities were measured using a dual luciferase assay (Promega, Madison, WI) and a luminometer (Turner Designs, Sunnyvale, CA). The parent luciferase reporter plasmid (pMIR-REPORT Luciferase) was purchased from Applied Biosystems (Waltham, MA), and 3′-UTR–specific constructs were prepared by the Emory Integrated Genomics Core. Serum was diluted with 5× PBS, and organelles were eliminated by centrifugation at 1000×g for 10 minutes at 4°C. The supernatant fractions were further centrifuged at 16,000×g for 30 minutes. The pellet from this step contains microparticles. The second supernatant was filtered through a 0.22-μm filter. Exosomes were pelleted by centrifugation at 120,000×g for 90 minutes at 4°C (L8–70M ultracentrifuge; Beckman-Coulter, Indianapolis, IN) and resuspended in 100–400 μl PBS. Exosome protein was quantitated by a Bradford protein assay, and the exosome protein marker, Tsg101, was evaluated by Western blot (Supplemental Figure 5). Exosomal RNA was isolated using an miRNAeasy Kit (Qiagen Sciences, Germantown, MD) and quantified using NanoDrop spectrophotometry (Thermo Scientific, Wilmington, DE). Data were presented as mean±SEM. To identify significant differences between two cohorts, data were analyzed using a t test. For comparison of more than two cohorts, a one-way ANOVA was performed; a post hoc Student–Newman–Keuls test was performed to identify differences between cohorts. In all cases, values of P<0.05 were considered significant. Research reported in this publication was supported by the National Institute of Arthritis and Musculoskeletal and Skin Diseases of the National Institutes of Health under Award Number RO1AR060268 (to X.H.W. ), National Institutes of Health (NIH) Grant R01DK095610 (to S.R.P. ), and Department of Veterans Affairs Merit Review Grants I01-BX001456 (to S.R.P.) and I01-BX000994 (to H.C.). The project was also supported (production of adeno-associated virus) by the Emory Viral Vector Core (supported by Emory Neuroscience National Institute of Neurological Disorders and Stroke Core Facilities Grant P30NS055077) and the Emory Integrated Genomics Core, which is subsidized by the Emory University School of Medicine and NIH/National Center for Advancing Translational Sciences of the National Institutes of Health Award UL1TR000454. The content is solely the responsibility of the authors and does not necessarily reflect the official views of the NIH, the Department of Veterans Affairs, or the US Government. B.W. and C.Z. contributed equally to this work. See related editorial, “MicroRNA as Novel Exercise Mimetic for Muscle Wasting in CKD,” on pages 2557–2559. This article contains supplemental material online at http://jasn.asnjournals.org/lookup/suppl/doi:10.1681/ASN.2016111213/-/DCSupplemental.